Deploy premium WordPress them is the perfect all-in-one landing page solution for your site that isn’t quite ready for public release yet, but you’re certainly ready to start engaging your audience and making contacts! Deploy premium theme integrates with Twitter, MailChimp, and Contact Form 7 to create a sleek whole that is definitely greater than the sum of its parts. Check out the live demo to see just why this theme is worth every penny it’s being sold for. 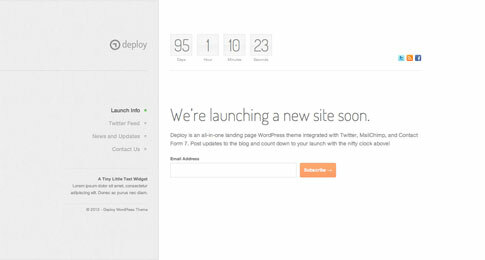 Come back and check out the showcase as we find more sites from around the web using Deploy.